Hello and welcome back to the blog after a break of several weeks. 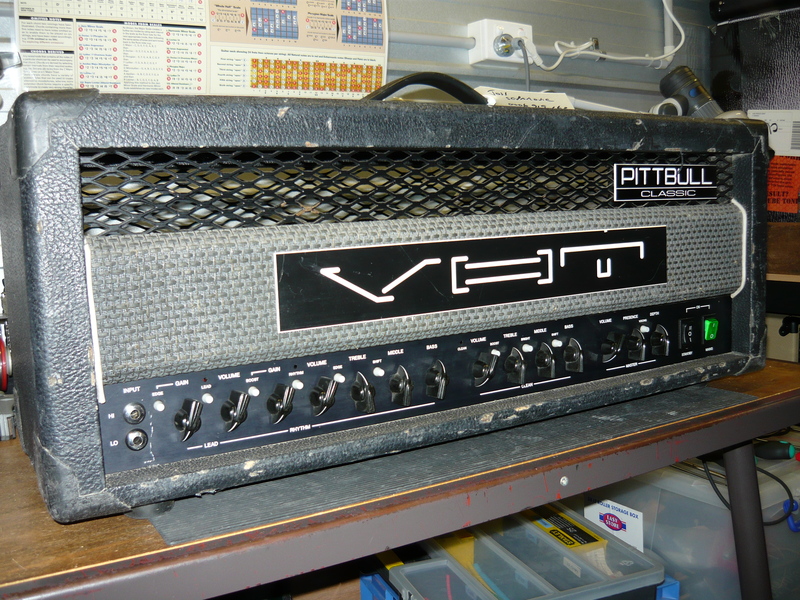 This time we are looking at a classic hard rock guitar amplifier from the USA, manufactured back in the early 1990’s: the VHT Pittbull amp. This example has obviously had a hard working life, and our repairs actually started with the cabinet, which was beginning to fall apart. The stated fault from our customer was there was a pop, then nil output. No fuse had actually blown, and all the valves tested OK, so the problem was in the circuitry itself. All of the circuitry in the Pittbull is mounted on two large printed circuit boards (p.c.b.’s) which run pretty much the width of the chassis. Unfortunately, they overlap and things are complicated by the board mounting arrangements, so it is a very time consuming job removing these boards for repairs, plus it’s fiddly, with the ever present danger of introducing additional faults that weren’t there in the first place. Even worse, the status LED’s that indicate which channel is active, are mounted below the boards where your fingers can’t get to them to line them up with the holes in the front control panel. Examination of the boards didn’t reveal any obvious component failure, but a check of the DC conditions with a DVM indicated problems with the low-voltage (LV) power supply, ie the +/- 18V DC rails (regulated). Apparently the signal path includes some solid-state circuitry, hence the complete loss of signal, and there is also some switching/control circuitry which is IC based. Unfortunately all the device identifiers have been intentionally rubbed off the IC’s ! The original VHT company definitely didn’t want to make servicing their products any easier than necessary. This is a design approach that we have never ever understood or endorsed. A silicon diode, part of the bridge rectifier for the LV supplies, had gone short-circuit, also causing the failure of filter capacitors and a regulator IC. We replaced the identified components, and also upgraded a few electrolytic capacitors while we had the board out. The LV supplies were now completely functional. As part of our routine electrical safety checkover, we noticed the mains fuseholder was wired incorrectly – strange to find such a basic error in a modern amplifier. We reversed the fuseholder connections and carried out a PAT test, and this amp now complies with Workcover NSW electrical safety standards. Having reassembled the chassis and reloaded the valves as supplied (with a very necessary rebias of the output stage – running too hot), the amp was given a power output test. This amp is quite a monster, with 540V DC supplied to the anodes of the EL34 output valves (like some very old Marshalls). We measured 35V into an 8 ohm dummy load which equates to 150 watts ! This is pretty impressive, considering the amp claims to be 100 watts. A burn-in test revealed no further problems, and the final play test showed this amp to be a much more versatile beast than you might have assumed. 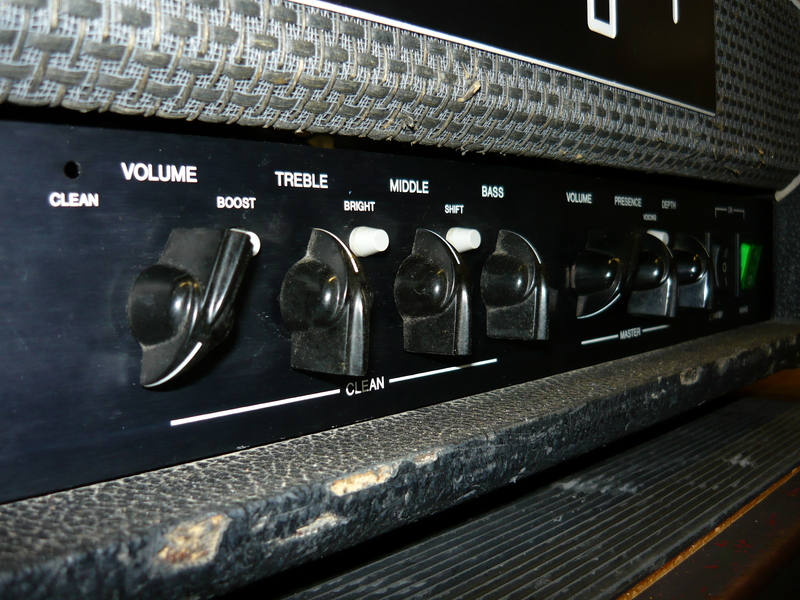 As a sweeping generalisation, we have found the “clean” channel in multi-channel switching amps to be a real disappointment, with all the emphasis placed on the high-gain performance at the expense of clean and crunch tones. 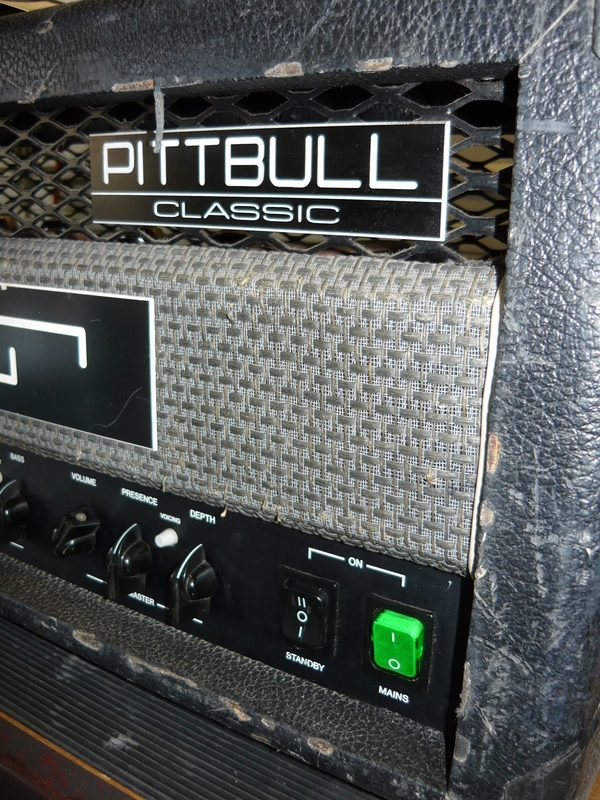 In this Pittbull Classic model, the three channels each offer two modes or gain levels and all the settings are useable. The “lead” and “crunch” channels do admittedly share the same EQ, but the very useable “clean” channel, with its own dedicated EQ, more than makes up for this compromise. Rock on ! Many thanks to Joss for supplying us with the subject matter for this blog. IR. This entry was posted on December 7, 2012 at 12:32 pm and is filed under Amp Repair, Amps. You can follow any responses to this entry through the RSS 2.0 feed. You can leave a response, or trackback from your own site. can you help me with 115 to 230 volt transformer rewire?